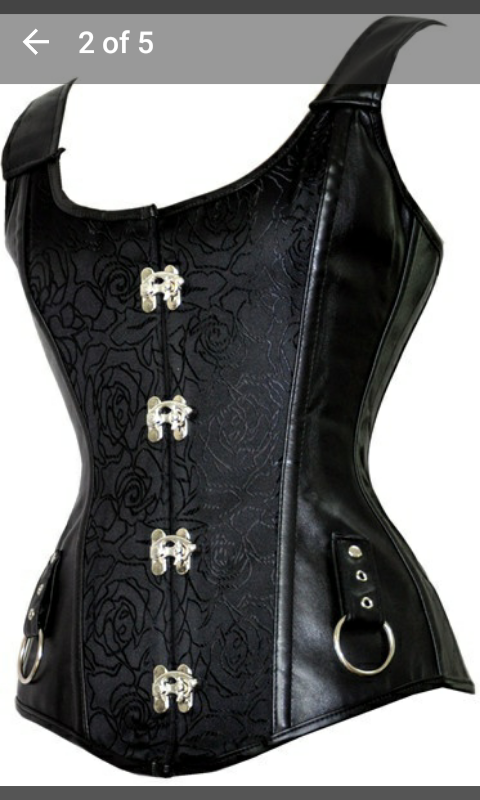 On September 10, 2016, I purchased this black faux leather and Steampunk-inspired brocade corset from the store Jenny Howard on the http://www.wish.com app. These five screenshots are from the Wish app. I placed an order for an XXL, instantly regretted my decision, deleted and cancelled the order and then purchased an XL. I didn’t know at the time if the charge for the first purchase would even make it to my credit card or not. Wish Customer Service replied to my messages promptly and reassured me that if the charge did appear, it would be removed within 5-10 days. I was informed I would recieve my XL corset between October 5 and October 17. I received the corset on Monday, September 26, 2016. It’s beautiful. The faux leather is good quality. The stitching is neat and finished on the black brocade. The metal embellishments are all polished and sturdily secured. There was only one thing wrong with it. It doesn’t fit. Like, not even close. And it was all my fault, not Jenny Howard’s. I had initially misread the Sizing Chart when ordering. This XL is for a US size 8 with a 34 inch bust. I knew that even the XXL I had originally ordered, at a US size 10 with a 36 inch bust, wouldn’t even have fit. 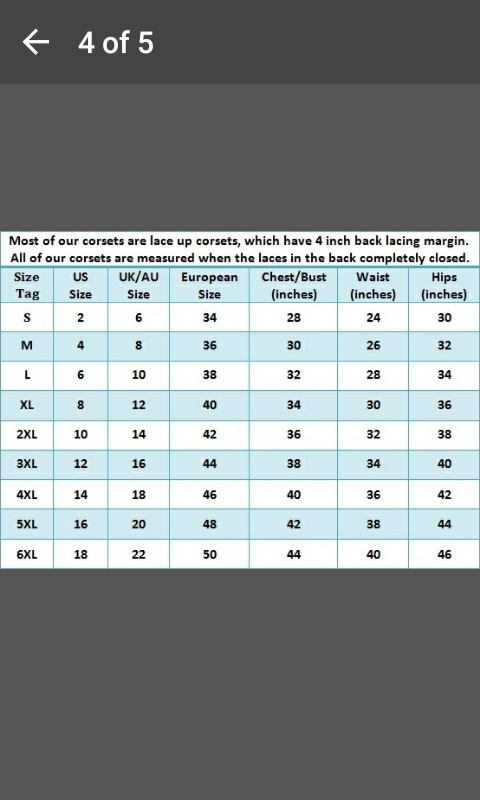 Unfortunately for me, XXL is largest size available for this particular style of corset (although some of Jenny Howard’s corset styles are sized all the way up to a 6XL). My bust is a 40-42, depending on the cut and manufractured of the clothing. It wasn’t going to happen, not even in a 2XL. Not at all. Nope. 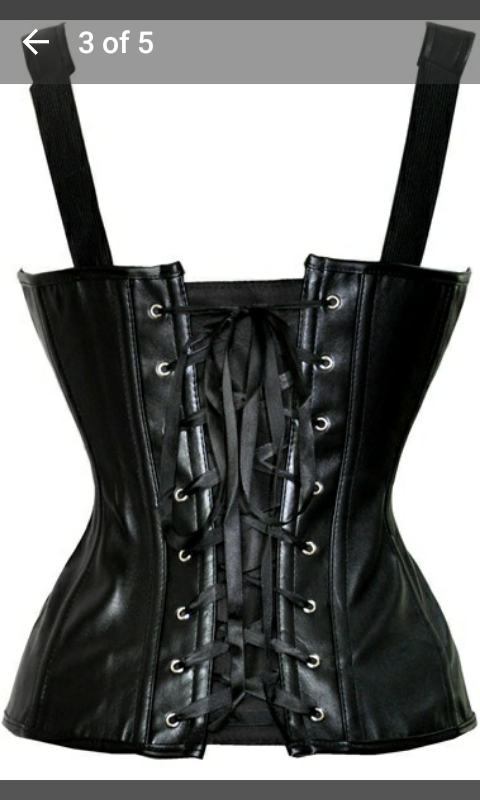 Especially since the corset is sized when it is already laced open at 4 inches so the corset has to fit perfectly. I was really upset that I couldn’t wear this beautiful piece but I contacted Wish Customer Service once again, this time, to learn about their return process, as I knew I could return within 30 days, per Wish policy. I received a response right away. I was informed that not only would my order be completely refunded within 5-7 days to my card, but also that I did not need return the corset to Jenny Howard at Wish and would I please keep it as their apology for my experience. I have to admit, I was floored. I would have never expected or even thought to ask for anything like that as a customer who was in the wrong. I was fully prepared to send it back to Jenny Howard/Wish. I thought *maybe* they’d have offered to send out a free shipping label or something but I NEVER expected to be instructed to keep the item and recieve a full refund. I’ve never experienced such exemplary Customer Service Support with any company, anywhere, ever. I cannot say enough good things about Jenny Howard and Wish.